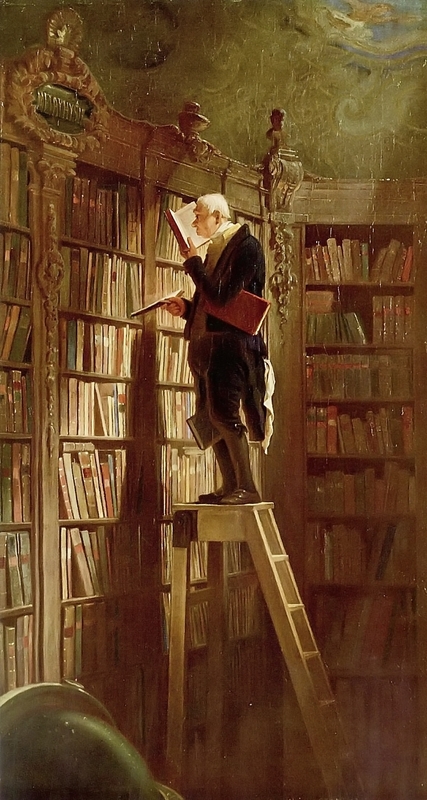 "The Bookworm" by Carl Spitzweg, version of ca. 1850, now located at the Museum Georg Schäfer in Schweinfurt, Germany. This website offers an overview of useful web resources that are available in English, i.e. library portals and document delivery services with a focus on information, access, literature in Germany that are offered to an international public. The Library Portal by the Goethe Institute constitutes a comprehensive collection of resources relating to German libraries and the information scene in Germany. It provides systematic overviews of the German library landscape and current and future trends, a schedule of events, and various articles and links as to international and national cooperations of libraries. This website introduces English language users to traditional and modern German literature. Famous German writers and their works are portrayed, e.g. Goethe, Hermann Hesse, Thomas Mann, Günter Grass. The English and Spanish language website informs readers about new literary titles in German (from Austria, Switzerland, Germany) that are recommended for translation, a special section is dedicated to childrens books. Further, a news category lists titles that have recently been translated. Additional resources concern German literary prizes and translator information.